The sense of smell is one of the most intriguing senses; the number of odors that animals can detect and discriminate appears vast and limitless. Not only does olfaction affect our quality of life, it also greatly impacts our well-being. In particular, insects that transmit diseases rely on olfaction to seek human hosts. To control odor-driven, host-seeking behaviors of insects, olfactory receptor neurons (ORNs) are likely the most ideal targets. As the first neurons in the olfactory circuit, ORNs not only determine all olfactory inputs in the periphery, but their direct contact to the outside world renders them susceptible to chemical and environmental manipulation. The overarching goal of our laboratory is to understand the molecular and cellular mechanisms by which ORNs process olfactory information, with a special focus on ORN responses to odor mixtures, using Drosophila for its powerful experimental strengths. Fig 1. Non-synaptic inhibition between grouped ORNs. Insect ORNs are housed in a hair-like structure known as a sensillum. This pairing of ORNs is highly stereotyped within insect species, but the functional impact of this organization has been unknown. Transient activation of the one neuron (purple) by a pulsed odorant inhibits the response of the neighboring neuron (green) to a background odorant. Inhibition of a sustained response by a transient response may provide a means of encoding salience. The emergent qualities of odor mixtures are generally attributed to processing in the central nervous system. However, we have recently discovered that sophisticated olfactory processing begins in the periphery, through two distinct mechanisms: first in an individual ORN and then in an individual sensory hair via direct electrical neuronal interaction, namely, ephaptic interaction (Fig. 1). Building on these studies, we seek to elucidate olfactory processing between grouped ORNs and within individual ORNs. Specifically, what are the biophysical principles of ephaptic interaction between grouped ORNs? What is the functional basis of ORN pairing? How does ephaptic interaction impact insects'odor-driven behavior? How do fly ORNs maintain sensitivity in the presence of continuous odor stimuli? What are the cellular mechanisms that govern normal ORN function? To address these questions, we use multidisciplinary approaches including fly genetics, molecular biology, optogenetics, electrophysiology, imaging and behavioral assays. Together, our laboratory aims to elucidate the fundamental principles of odor coding in the periphery, as well as reveal new avenues for manipulating insect olfaction in the fight against insect-borne diseases. Su, C-Y, and Carlson, JR (2013). Circuit logic of avoidance and attraction. Science 340, 1295-1297 (Perspective). Su, C-Y, Menuz, K, Reisert, J and Carlson, JR (2012). Non-synaptic inhibition between grouped neurons in an olfactory circuit. Nature 492, 66-71 (Research Article). Research highlighted in “News and Views” by Shimizu, K. and Stopfer, M. “Olfaction: Intimate neuronal whispers” in Nature 492, 44-45 (2012), and “Generally Physiological” by Adler, E.A in J. Gen. Physiol. 141, 149-150 (2013). Su, C-Y, Martelli, C, Emonet, T. and Carlson, JR (2011). Temporal coding of odor mixtures in a receptor neuron. Proc. Natl. Acad. Sci. USA 108, 5075-5080. Carey, AF, Wang, G, Su, C-Y, Zwiebel, LJ and Carlson, JR (2010). Odourant reception in the malaria mosquito Anopheles gambiae. Nature 464, 66-71 (Research Article). Research highlighted in “News and Views” by Leal, WS, “Behavioural neurobiology: The treacherous scent of a human” in Nature 464, 37-38 (2010). Su, C-Y*, Luo, D-G, Terakita, A, Shichida, Y, Liao, H-W, Kazmi, MA, Sakmar, TP and Yau, K-W* (2006). Parietal-eye phototransduction components and their potential evolutionary implications. Science 311, 1617-1621 (*corresponding authors). Research Highlights in Nature Rev. Neurosci. 7, 332-333 (2006) and in Sci. Signaling Editors’ Choice, “Evolution: Eye of Lizard”, Science’s STKE 327, tw104 (2006). 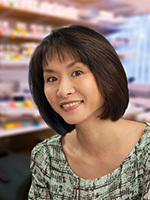 Chih-Ying Su received her Ph.D in Neuroscience from Johns Hopkins University School of Medicine and carried out her postdoctoral research with Dr. John Carlson at Yale University.